Each chapter of my book covers one term in the definition of a cloud: a visible mass of water droplets or ice crystals suspended in the atmosphere above the earth. This fourth posting covers the chapter on Water. "First things first: cloud droplets are not teardrop-shaped. They are tiny, spherical balls or globes. Raindrops are not teardrop-shaped either. Small raindrops are spherical and large ones are shaped like hamburger buns--flat on the bottom and slightly convex on the top. Even human tears are not teardrop-shaped. When they appear (in our eyes and on our cheeks) they are shaped like puddles and rivers. The only time water droplets naturally assume the teardrop shape is wen, as a collection of many droplets, they drip from a leaky faucet." Understanding the shape of water is no easy task. The most difficult chapter of my book to write and the one that required the deepest plunge into atmospheric science and physics, was the chapter on droplets. What made the droplets of water in clouds different from other water in the atmosphere? Was it a matter of droplet size? Was it something in the droplet? What was the difference between the water in the cloud and the water next to the cloud in the blue sky? Water water everywhere...These small clouds (cumulus humilis) are composed of liquid water droplets. The blue sky around the clouds contains anywhere from zero to four percent (by volume) of invisible water vapor--molecules of water too small to be considered droplets, too small to scatter sunlight toward our eyes so we see a watery whiteness that is a cloud. A droplet is a collection of enough water molecules to scatter sunlight and become visible to the naked eye. "Enough" is billions of water molecules (H20), which adds up to between 2 and 200 micrometers (one micrometer is 1/50th the diameter of a human hair). This is significantly larger than the wavelengths of visible sunlight hitting those droplets. Those wavelengths are between 0.4 and 0.7 micrometers. These numbers did not help me understand the magic of the cloud droplet so I spent an afternoon at the Atmospheric Science Department's outreach office at the University of Washington in Seattle. Here, with the help of a very patient grad student, I plunged deeper and deeper into the vastly tiny world of the droplet...down into to the molecule...down into the hydrogen atom...the oxygen atom...the subatomic particles...and lots of squirmy lines and dashes that represent energy moving through the atmosphere. Understanding what a "droplet" was led me to The University of Washington where I reached a deep understanding of how much I didn't not understand. The human brain isn't very good at imagining the very huge or the very small. 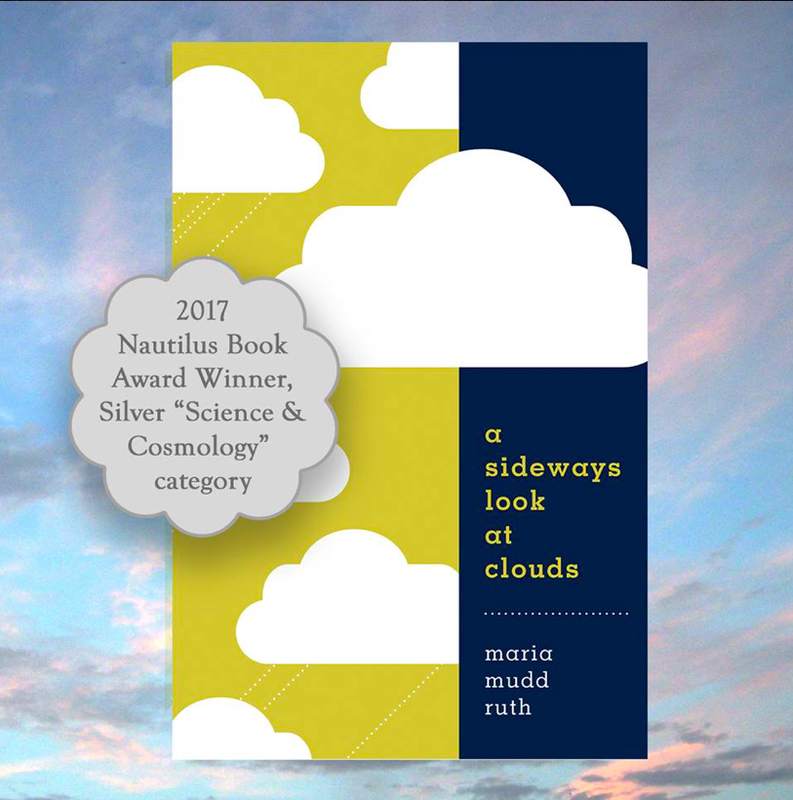 So holding the idea of a cloud and the subatomic world of the water droplets in that cloud simultaneously in my mind's eye was stupefying. It was as if my brain simply shut down (perhaps to prevent it from exploding). Over the years, I have kept at it. I watch the clouds and try to grasp the fact that some are stretching across the landscape for several thousand of square miles or are reaching heights of 47,000 feet. 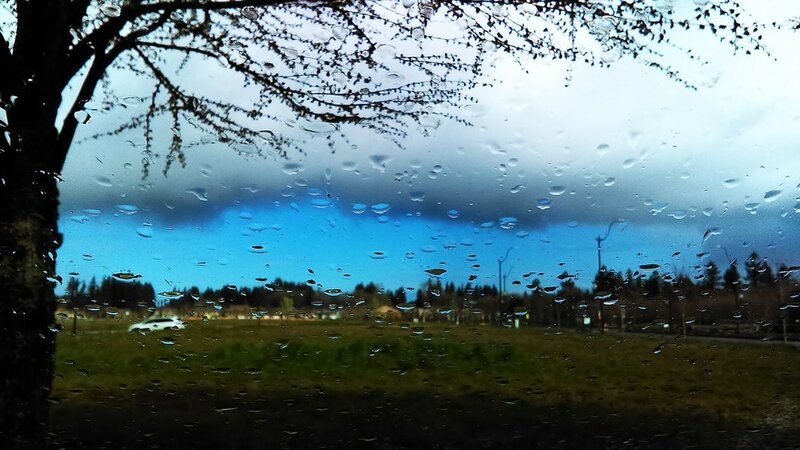 And then I try to imagine the unimaginable quantity of droplets--all the little tiny spheres of water--in those clouds. This is much easier to do when you are walking in the fog, which I hope you do. Though you may not get a sense of the size of the mass of fog you are walking in, you will be able to see the liquid water droplets floating in the air around you. Notice there is space between them--that's the water vapor, the invisible form of water. This is an Altostratus translucidus (translucent enough to reveal the position of the sun, but thick enough to block it from creating shadows). The patches and shreds of lower gray clouds (possibly stratus fractus, or scud) would be white if the Altostratus weren't present. Though this mid-level layer cloud is considered "boring," it is fascinating in its own right. This cloud is composed primarily of frozen water--ice crystals and snowflakes--and may even have liquid-droplet clouds embedded within it. This cloud is typically more than 6,500 feet thick and spread over several thousands of square miles. It is not a precipitating cloud (that's the lower Nimbostratus) and is very useful for improving your photography. These clouds are thick enough to prevent the sun from casting shadows and so create a soft, filtered kind of light that is ideal for avoiding squinty selfies, capturing detail and texture of small things in nature (flowers, insects, leaf veins), and waterfalls. Don't wait for a sunny day to get out in nature with your camera. Altostratus clouds allow for great upclose photos. 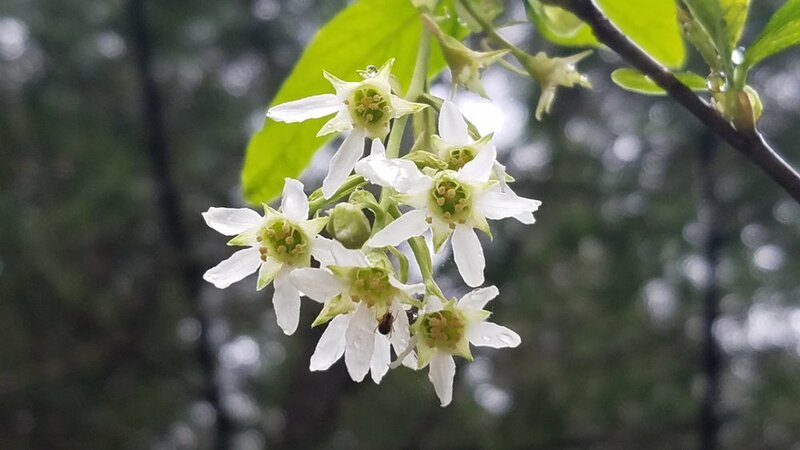 Here, our native Osoberry blossoms shelter a tiny spider as an umbrella. Doesn't it know that Altostratus don't rain?